Today in Masonic History Theodorus Bailey passes away in 1877. Theodorus Bailey was an American naval officer. Bailey was born in Chateaugay, New York on the United States-Canadian border on April 12th, 1805. He received most of his primary education in Plattsburgh, New York. In 1818, before his 13th birthday, Bailey was posted as a midshipman on the frigate Cyane. The Cyane was tasked from 1819 to 1821 with patrolling the west coast of Africa to guard a new United States colony. The colony was made up of former slaves. While still on the Cyane, in 1821, Bailey saw his first combat when the ship engaged West Indian Pirates. Later in 1821, Bailey transfered to the ship of the line Franklin. During this period a ship of the line was a vessel built with the single task in mind. In combat the a ship of the line along with other similar ships would line up to fire against opposing vessels. Generally the ship that could deliver the biggest broadside would win the engagement. It was common from the 17th century to the 19th century, when ships of the line were built, that new construction vessels were going to be bigger and more powerful to win these types of engagements. Bailey would go with the Franklin to the pacific. In 1827, after a returning from the pacific and spending three years on a vessel in the West Indies, Bailey received his commission as a lieutenant. Over the next 19 years, Bailey would serve on a variety of vessels and would circumnavigate the world twice. On one such journey he would search for marooned American seaman. In 1846, during the Mexican-American War, Bailey would assume his first command, the Lexington. He would sail the Lexington from New York city to the west coast of the United States by way of Cape Horn. On Lexington he would blockade San Blas in Lower California and would raid the town at one point capturing several pieces of ordinance. In 1848, Bailey would leave the Lexington to go on extended shore leave. He would receive new orders 5 years later to command the sloop of war St. Mary's. He would travel to Philadelphia where the ship was under repair. From 1853 to 1856, Bailey would sail the St. Mary's around the southern and eastern Pacific. In 1855 he would be promoted to Captain and would be relieved of command of the St. Mary's in 1856. In the four years leading up to the Civil war, not much is known about Bailey's work. He was put on an unspecified special duty and was awaiting new orders. In June of 1861, Bailey received orders to command the steam frigate Colorado. He would be assigned go join the Gulf Blockading Squadron. When the ship arrived in the gulf it was named the flagship of the squadron when flag officer William Mervine embarked. In 1862, Bailey relinquished command of the Colorado and headed back north. There he would promoted to Commodore. By the end of 1862, Bailey would be heading south again this time to become the flag officer of the East Gulf Blockading Squadron. 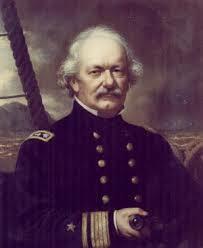 He held that post until 1864, when he was transferred to the Portsmouth Naval Shipyard. He would be promoted to Rear Admiral in 1866 while serving in Portsmouth. He would officially retire later that same year. He would remain as the commanding officer of Portsmouth Naval Shipyard until early in 1867, despite his retirement status. Baily passed away in Washington, D.C. on 14 February, 1877. Bailey was a member of Washington Lodge No. 21 in New York City, New York.